ORLANDO, Fla. – FlightScope, a world leader in the development and manufacturing of 3D Doppler tracking radars for sports, announces today the launch of the world’s first Environmental Optimizer (FS|EO), giving golfers a new way to analyze, practice and improve their game. FlightScope’s new innovative component for the X3 tracking radar gives users the ability to configure environmental conditions, without physically changing locations – meaning golfers who typically practice in flat, low altitudes, and vice versa, can now practice smarter and see how their shot would match up against an entirely different environmental climate. FlightScope’s Environmental Optimizer technology now allows players to practice for a tournament’s specific terrain, without having to physically leave their home course. This feature gives golfers instant feedback on their smart phone or tablet and allows users to configure the impact of several environmental conditions, including: altitude, humidity, relative landing height, air temperature, wind speed and wind direction. The X3 tracking radar allows players to analyze data points such as their launch speed, carry distance, flight time and putter path, and currently serves as a tracking radar to professional golfers such as Bryson DeChambeau, Bubba Watson and World Long Drive Champion, Joe Miller. The X3 tracking radar helps players analyze their data, improve performance and practice with a purpose. The newly upgraded software is available for X3 owners and will be demonstrated at the 2019 PGA Merchandise Show along with a new multi-cam feature, so golfers can automatically record and sync data from multiple cameras for instant review on one screen. The new edition also comes equipped with data margins, allowing players and coaches to set minimum and maximum values for any data parameter to practice smarter and improve consistency. For more information on FlightScope and to submit a purchasing query for FlightScope’s 2019 X3 tracking radar, please visit https://flightscope.com/. Leading the way in sports technology, FlightScope developed a high-performance 3D phased-array tracking radar for a variety of sports and remains committed to delivering world-class products with excellent support. Founded in 1989 to measure projectiles for the defense industry, FlightScope evolved into sports applications to help athletes be better and master their game through technology. 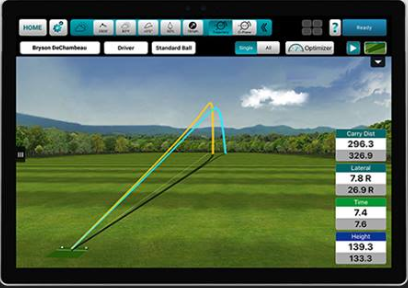 Recognized for its accuracy of data and ease of use, FlightScope represents the state-of-the-art in sports measurement technology. This enables players to analyze every aspect of their game with ultimate precision in their pursuit of excellence.